You must check for safety, fit and function on every aftermarket stock installed. Safety is the primary consideration! Although we strive to achieve it NEVER assume it will be a perfect fit out of the box. Every individual gun is a law unto itself. Check out our discussion of Choosing Your Stock once you determine the important information outlined below. Welcome to the world of custom stocks! We have designed this entire business around promoting the safe use of firearms by enhancing the enjoyment the average person can expect to receive from getting more involved with his or her rifles and shotguns. By making them more comfortable to shoot, more suitable for the intended usage, more accurate and far more attractive we can take this sport out of the black plastic realm it has been stuck in and into a far more friendly and useful era. Everything we sell is designed to be installed in an evening or two at home with very little, if any, difficulty for the average hobbyist. To this goal, unless otherwise indicated, all of the gunstocks we sell are designed to be a "drop-in fit." It must be noted however that due to the normal variations among models as well as certain tolerances that factories may or may not routinely adhere to, some minor fitting and/or additional parts may be required to achieve the desired results. Like most of us that take immense pride in crafting and owning a truly self-customized firearm, we hope you view this as an enjoyable and often necessary part of the refinement process. Although they are not always necessary and we take great care to achieve a drop in fit out of the box you must be willing to make them if necessary when your new stock arrives. Some of the more common adjustments required are discussed on our Fitting / Bedding page and are included in the box with every stock purchased. Is it a long or short action? If you have a .223, .243, 6mm, .257, .308 or similar length cartridge you most likely have a short action. Conversely, the .25-06, .270, .280, .30-06, 7mm Mag, .300 Mag, .300 RUM, 8mm Mag, .338 Mag, .375 H&H or similar you may have a Long Action rifle. Please refer to the photos and discussion below and be sure to take a minute to measure. How do you unload your magazine? If you cannot remember, be sure it's unloaded, turn your gun over and look. On a bolt action, is there a Detatchable Box/Clip Magazine, Hinged Floorplate or is it 'Blind' (wood underside)? Lever guns and some automatics have tubular magazines, that is the cartridges are held in a tube parrallel to the barrel. What kind of barrel does it have? Is it a Featherweight? Standard Sporter? Magnum? Sendaro? Varmint? Police? Bull Barrel? Need to know before stock selection as the width of the forend will vary. Not all guns have aftermarket stocks widely available. You might also not be aware that many of the stocks we carry are only carved once or twice per year - if that! It often happens that we, as American consumers, assume a retailer's products are always available in bottomless bins. In this world of mass-produced foreign imports please bear in mind that the gunstocks we sell are more unique than that. They are hand crafted by sportsmen like you right here in the USA. In other words they made to our (or your) order, not stamped out on machines and stockpiled in warehouses. Due to prevailing conditions we do our best to be sure they are the best on the market, but the one you have your sights set on may or may not be available very far into the future. Git 'em while we got 'em! Please use the following table as a rule of thumb guide - simply provided for your convenience. Be sure to double check all model numbers and availibility on the main site because they can and do change. DON'T FORGET TO USE THE STOCK FINDER ON THE UPPER LEFT SIDE OF EVERY PAGE! Inletting is a term applied to woodworking that refers to the cut-out that lets something to fit into it. Just as water flows into an inlet in the land, so should a piece of metal, in this case a rifle's barrelled action, fit into the wood or synthetic material being used as a handle with which to operate it. So a stock is inlet for a particular action, action length (referred to simply as "long" and "short" versions), magazine style and barrel weight. See our Barrel Contours page for more common measurements. Featherweight / Mountain / Compact - generally the lightest weight version of a rifle, skinny barrel. Sporter - the most common version of most sporting rifles - standard weight barrel. FBC - Factory Barrel Channel (generic for one size fits all) fits sporters and magnums. Mags could sometimes use a very light sanding. Mag (magnum) - some manufacturers use a slightly heavier barrel (0.03" average) on magnum cartridges. Sendaro - fluted barrel on Remington 700 "Sendaros is the same taper as their varmint barrel. Varmint - not quite a bull, but getting there; called BBC by the stock makers. Bull Barrel- strictly speaking this is a straight cylinder, usually 1.250" in diameter. Most BBC stocks will take a full bull but you will have to do the fitting. If you have a featherweight, compact or mountain rifle it will not look too great in a sporter stock. It will not be centered in the barrel channel (see below) Buy a stock that was designed for it. If there are no stocks made for it only option is an FBC with a full length bedding job. When the only option is a sporter barrel channel (i.e. the B&C 2963) it is really easy to fit a magnum. Heavy barrels and custom Palma tapers will not work however. You cannot fit a varmint barrel into any sporter stock we know of unless you are willing to give up the 'flats' on the top of the forend. We do not recommend this. Laminated stocks cut for the FBC are drop-ins for standard cartridges and usually drop-ins (albeit tight) for magnums when the factory concerned used a magnum barrel contour (Remington for example). We would suggest spending 10 minutes on the barrel channel with some 100 grit but hey, that's us. Free floated barrels are never centered in the barrel channel. It's not the stock's fault. That is the real reason the factories put those pressure pads in the forend and Savage has been gluing barrels to their stocks. Do a quality bedding job that supports the first 2 inches of barrel and center it yourself. Remington fluted sporters are magnum tapers and take the same stocks. Remington Sendaros are varmint tapers and take the same stocks. Do not use the model number, serial number, numbers stamped on the box or what your buddy told you to buy your new stock! You must follow the simple instructions or you may make a mistake. If you own a Savage short action you must measure your takedown screw spacing as well. Browning A-Bolt 7 3/16" 7 7/8"
Howa/Weatherby 7 1/4" 7 3/4"
Ruger 77* 7 3/4" 8/1/4"
Savage 110** 7 1/2" (no stocks available) 8"
Remington 700*** 6 1/2" 7 3/8"
Remington 788 6 3/4" 7"
A 700 is a 700, only differences are the action length, LH or RH and bottom metal. They don't make a different receiver for the various versions. VLS, XCR, SPS, AWR etc are new designations for the original hinged-floorplate BDL. They don't make very many production ADL's any more, they generally use an inexpensive finish, plastic stock and less expensive BDL-style bottom metal and call it an SPS. If it unloads through a hinged floorplate it's a BDL for our purposes here, no matter what they are calling it this week. Rem 700 ADL - Designed with trigger guard only; blind magazine. Rem 700 BDL - Designed with hinged floorplate assembly. Includes SPS, XCR, VLS and any other hinged floorplate 700 rifle for our purposes. Rem 700 CDL - Identical to BDL. Rem 700 SPS - Identical to BDL. These replaced the ADL in Remingtons product line but they take BDL stocks. Remington's site states they replaced the ADL, not that they are an ADL. They take BDL stocks. Please note they are available with sporter and varmint weight barrels. Rem 700 DBM - see discussion below. Rem 700 VTR - triangular barrel is a varminter with the sides simply flattened, takes the same stocks. Since there's no forend barrel channel on the Knoxx Axioms per se, barrel weight matters not. Check out our First 3 Things discussion also. 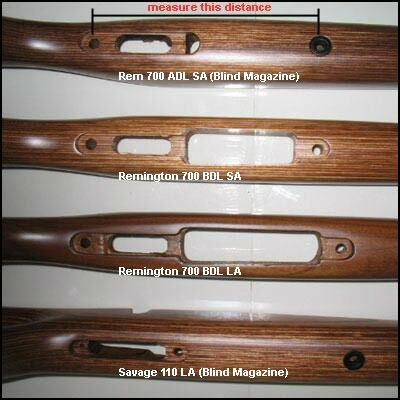 Remington 798 are Interarms Mauser 98's and take the same stocks. Remington 788 action lengths are not standard, be sure to pay attention to the list. Remington 710 and 770 stocks are only available from Remington. They attach the recoil lug to the stock not the receiver so it is unlikely anyone will make a stock for it. Get a 700 if you want to customize. Rem 721/722 rifles can be fitted to BDL stocks using existing parts or converted to ADL/BDL/CDL versions with updated parts. Stocky recommends you stash the old bottom metal (or sell it to a collector) and upgrade to an ADL or BDL. Conversion between floorplate versions (i.e. BDL) and blind magazine versions (i.e. ADL) are easily accomplished from Remington (or Winchester and Savage for that matter) for about $50 to $150. Contact us or the manufacturer for parts. Rem 700 DBM - Identical stocks to the BDL except has slots in the side of the stock to accomodate magazine release buttons. You can file these slots yourself (see below). Aftermarket detachable magazine systems do not have these slots (i.e. Wyatt's or HS Precision DM's) so you'd want a standard BDL stock and take it from there. IMPORTANT NOTE: Since Remington machines the feed rails off of their DBM receivers they cannot be converted to ADL or BDL magazine systems even though the stocks are basically the same (see above). If you want a better detachable mag system that will usually drop in to a BDL stock and will replace the Remington DM (or ADL/BDL for that matter) check out our Wyatt's DBM kits. In other words, if you have ANY Remington rifle, DM included, you can get any of our BDL stocks (of the correct action length and barrel of course), add the Wyatt's DBM kit and it will all go together with little or no fitting. Detachable Box Magazine stocks are easily fashioned from BDL stocks by simply filing the slots for the magazine release buttons (see photo) and retouching the area to match. Detachable mag-fed rifles cannot be converted to non-clip-fed guns but you can easily replace the factory version with an aftermarket system. All other Remington 700 rifles are convertable (i.e. ADL > BDL > CDL) by simply purchasing the appropriate parts. *Ruger 77 and 77 MK II - Measure the full length of the trigger guard. The older M77 safety is on the tang behind the bolt.The newer M77 Mark II safety is on the bolt itself. These stocks are not normally considered interchangable but there are those that claim to have done it. NOTE: SAVAGE 2-digit (i.e. Model 10 or 12) SOME SHORT ACTION STOCKS ARE AVAILABLE FOR 4.27" (4 1/4") TAKEDOWN SCREW SPACING AND OTHERS FOR THE 4.40" (4 3/8") SCREW SPACING. THESE ARE THE FRONT 2 SCREWS, THE MAIN ONES THAT HOLD THE STOCK ON THE RECEIVER, MEASURED CENTER-TO-CENTER ON THE HOLES IN THE RECEIVER. SAVAGE CHANGED THEIR DESIGN A FEW YEARS AGO SO IF YOU HAVE A NEW GUN IT IS LIKELY 4.40". THERE IS NO WAY TO TELL FROM MODEL NUMBER OR SERIAL NUMBER, THE ONLY WAY TO BE SURE IS TO MEASURE. PLEASE BE SURE YOU ORDER THE CORRECT STOCK, VERY FEW STOCKS ARE AVAILABLE BOTH WAYS SO PLEASE PAY CLOSE ATTENTION TO THE SPECS PRIOR TO ORDERING. The older design internal magazine box has a staggered feed magazine sleeve that is attached to the receiver. The newer design internal magazine box has a center feed magazine sleeve that is not attached to the receiver and is held in place by the stock. The newer Detachable Box Magaine system has a center feed detachable magazine box. Button Style: This is the one with the button on the side of the stock. There's no longer any stocks available for these 110C models but you might try calling Savage parts directly. DBM Style:The newer Savages feature a DBM similar to Remington's and we now offer an HS Precision Tactical PST118 that will fit them IF yours is on the 4.40" screw spacing. All receivers are the same regardless of classic, XTR, push feed, etc..Prior to 1985 all were long action regardless of chambering so be sure to measure if in doubt. There are three floorplate configurations: Simply remove your takedown screws to discover what you have. Blind Magazine (we have laminated stocks).One-piece floorplates (Super Grades and recent USRA production runs). One-piece floorplates (if the triggerguard and hinged cover are attached to each other, it's a one piecer.) Most new M70 rifles have one piece floorplates. Many stocks (some laminates, Bell & Carlson, HS Precision, etc.) are cut for the 2 pc floorplates. The 2 piecers were the most popular configuration from like 1965 thru the '90s. One piece floorplates are on most current M70's. If the stock you want comes only one way or the other, you can simply get new or used parts and install them into the correct stock to convert, no gunsmithing is required. ****Winchester 70 Super Short Action = 6 1/2".Winchester Super Short Magnums will NOT work with Standard Winchester SA stocks. Please contact us for availability. Mauser bolt action rifles have been produced for over 100 years in a wide variety of calibers, from many manufacturing plants all over the world. Most of these guns have several critical dimensions in common, allowing us to group them as Small Ring, Yugo and Large Ring Mausers. Small Ring Mauser - Receiver measures 1 1/4” on the front receiver ring and 7 5/8” center to center on the trigger guard screws. Fits most models: 93, 94, 95 & 96 rifles and carbines. Large Ring Mauser - Receiver measures 1 3/8” on the front receiver ring and 7 7/8” center to center on the trigger guard screws. Includes most large ring actions as well as the Centurion FN, Parker Hale 1200, and the Santa Barbara. 98 bolt channels must be rasped in. Yugo Mauser - Receiver measures 1 3/8" on the front receiver ring and 7 5/8" center to center on the action screws. Includes M48, M48a & M24 Yugoslavian. Bolt cut will also need to be rasped in. Note: Minor fitting may be required on Mauser stocks due to the wide variety of Mauser actions available. We will typically specify a narrow #1 contour barrel channel as below for all Mausers. This way everyone can use them as most barrels are bigger. Steps, bands and custom tapers must be hand fitted. BARREL A B C D E F WT.